Up 16% since 2009. And they fall harder on minorities in states like Wisconsin. Each year, thousands of Americans are killed while walking on dangerous roads. Photo from Transportation for America. Each year, nearly 5,000 Americans are killed in traffic while walking. Over the last decade, the human toll comes to more than 46,000 people — daughters, sons, fathers, mothers whose lives were cut short. News reports tend to blame the victims of these crashes for transgressions like “distracted walking” or crossing where they shouldn’t have. But a new analysis from Smart Growth America (SGA) highlights how pedestrian deaths are a systemic problem caused by the dangerous design of our streets and transportation systems. You can tell that systemic factors are at work because dangers to pedestrians are not distributed equally. The SGA report highlights how pedestrian fatality rates vary dramatically by race, income, and location. Florida pedestrians are at the greatest risk. Graph by Smart Growth America. SGA examined pedestrian fatality rates and the prevalence of walking to work to create an index measuring the danger of walking in different metro regions and states. 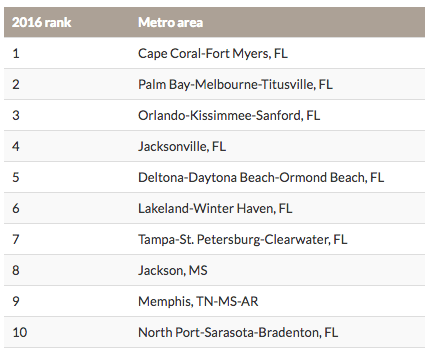 Fort Myers, Florida, is the most dangerous metro region in the country for walking, according to SGA’s index. Residents there are nearly four times as likely to be killed while walking as residents of the Minneapolis region. Other parts of Florida are also remarkably hostile to pedestrians, a fact that can be attributed to the state’s car-centric road design. Eight of the 10 most dangerous U.S. cities for pedestrians are located in Florida, according to the new SGA ranking. While Florida is exceptional, walking almost everywhere in the Sun Belt is more dangerous than average. Of the 10 worst states, six are in the southeast, while Texas, New Mexico, and Arizona account for another three slots. These regions boomed in the highway era, and they tend to have wider, more dangerous roads and fewer walkable areas. 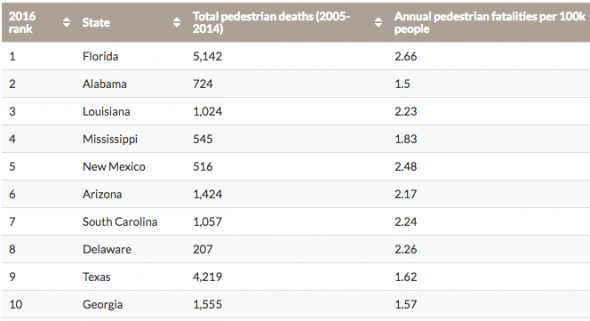 The most dangerous states for pedestrians are almost all in the South. That’s no coincidence. Graph by Smart Growth America. The pedestrian fatality rate for Native Americans is nearly five times higher than for white Americans, and for African Americans the rate is nearly twice as high. Racial disparities persist after controlling for varying walking rates among different demographics, SGA notes. Graph by Smart Growth America. In some states, racial disparities are even more stark. 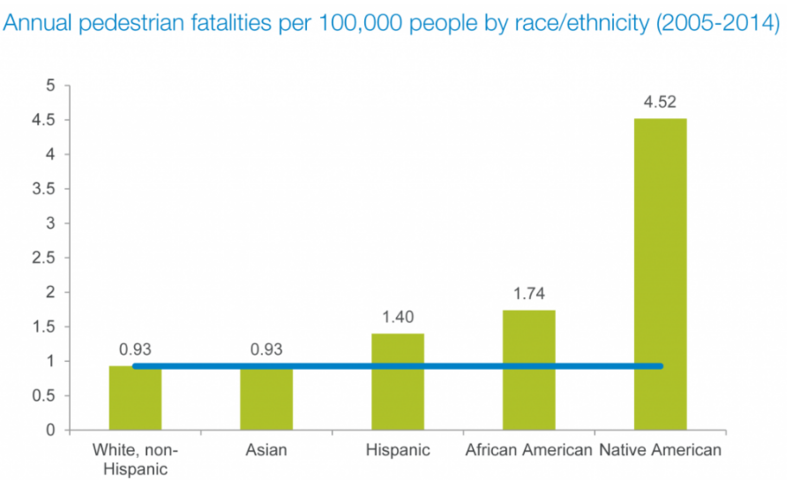 In Louisiana, for example, people of color are nine times more likely to be killed while walking than white people. In Texas, the risk is about three times greater. SGA attributes these disparities to “disproportionately unsafe conditions for walking” where people of color live in these states. 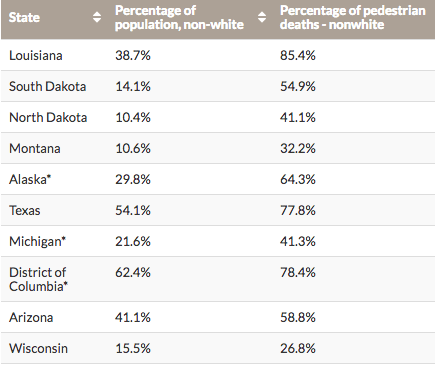 The states with the biggest racial disparities in pedestrian deaths. Graph by Smart Growth America. There are only eight states where people of color are not disproportionately at risk while walking: Connecticut, Delaware, Maine, Nevada, New York, Oregon, Vermont, and West Virginia. 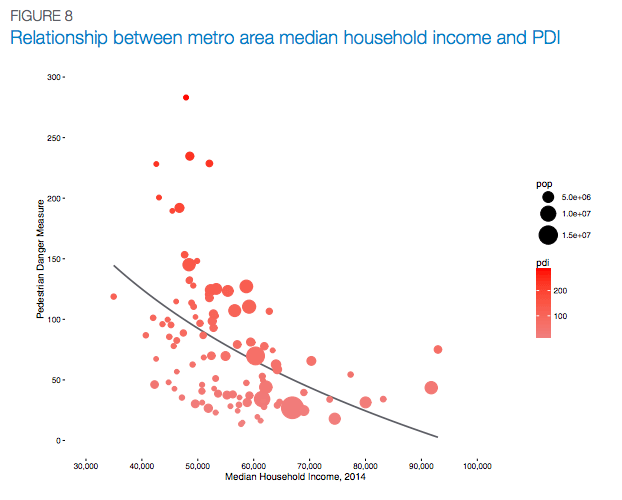 The poorer a metro area is, the more likely it’s a deadly place to walk, according to SGA. As average incomes rise, the risk of being killed while walking falls. Chart by Smart Growth America. This aligns with previous research showing that lower-income areas — the places that need safe walking conditions the most — often lack sidewalks and accommodations for pedestrians. On average, about 13 people are killed while walking each day in America, and the problem is getting worse. From 2009 to 2014, annual pedestrian deaths increased about 16 percent. Most local governments still rely on education and enforcement to promote street safety. But to save lives, says SGA, there’s no substitute for redesigning streets to prioritize walking and pedestrian safety. You can use SGAs’s interactive maps to explore the most dangerous streets where you live. Streets are part of the problem, surely. But more important are laws and customs. Here in Milwaukee and Wisconsin icars are given the right of way. We could, as has been done in some places, invert it. Make cars stop pedestrians anywhere. All they have to do is step off the curb. Give humans rather than cars the right of way. The design of roads is never enough, or a match for awareness. 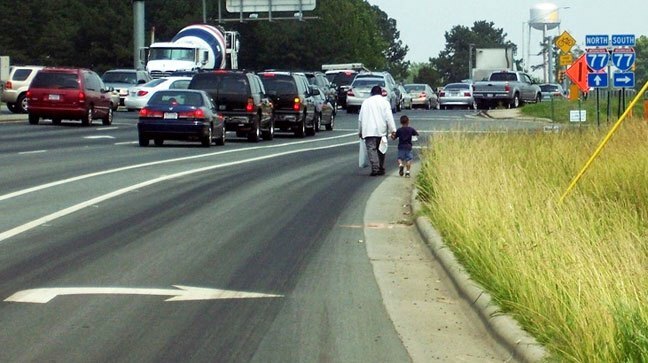 If we value trips of humans on foot equally to humans in cars, that would do the trick. Also, the date shows that people who don’t own cars are more likely to die because of a car.